Bird’s nest soup has been consumed in China as a health food for over 400 years. Benefits range from smoother skin complexion to an overall boost in immune system strength. Soak bird’s nest in water for a minimum of two hours to overnight to expand the strands. Separate the strands and clean the nest of impurities. Discard water. FOR TRADITIONAL SAVORY SOUP: Add the cleaned bird’s nest in prepared clear chicken broth or stock. Fold in beat egg white for texture and cooking sherry for fragrance. Add salt and pepper to taste and thickener (such as cornstarch) if desired. Serve warm. FOR TRADITIONAL SWEET SOUP/DRINK: Steam the cleaned bird’s nest with rock sugar according to your taste (average about 30 minutes). Steam longer for softer strands or shorter for firmer strands. FOR A MODERN TWIST: Your imagination is the limit! Add cleaned bird’s nest to your favorite vegetable soup or stew for a giant health boost! Our delicious bird’s nest drinks offer a more modern approach to traditional bird’s nest soup. It can be served chilled, at room temperature or warmed up for comfort on a cold day. FOR A MORE CONCENTRATED DRINK WITH FRUIT: Add Blessing Birdnest’s 7 oz. single jar to a big bowl of fresh fruit cocktail for s simple and healthy dessert the whole family will enjoy. FOR SOMETHING WARM AND SOOTHING: Add Blessing Birdnest’s 7 oz. single jar to almond milk and bring to a boil. Add gingko nuts for comfort food at its best! When traveling, never forget to bring a jar or two of 5 oz. Blessing Birdnest drinks with you in your checked luggage so that you’ll never be without the best quality bird’s nest any place you go! A Blessing Birdnest original recipe! Bird’s nest makes a great pastry filler and tastes best when it is of the highest authentic quality such as that of Blessing Birdnest nests. Our recipe offers an exciting twist on this ancient heritage food. Enjoy a warm bird’s nest pastry at any time, but especially on cool winter days. FOR A PASTY FILLER: Prepare your traditional pastry filler recipe and add pre-soaked and cleaned Blessing Birdnest as part of the filler (for instructions on cleaning your nest, please refer to bird’s nest soup recipe). Bake pastry per instructions. FOR AN UPGRADED TRADITIONAL PASTRY: Fold in pre-soaked and cleaned Blessing Birdnest into phyllo (filo) dough to and follow baking instructions to make baklava and other Middle Eastern pastries with a healthy boost. Recipe courtesy of A Bit of Bees Knees. In a small pot, boil 2 cups (16oz) of water. 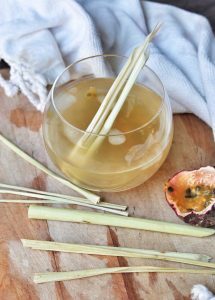 Cut lemongrass stalk into thin strips and place in boiling water; boil until fragrant and water turns a light amber color. Strain water into 2 glasses over ice and discard the lemongrass stalks. Add half a bottle of Blessing Birdnest drink to each glass. Top with a spoonful of passion fruit pulp and an extra stalk of lemongrass. Add more ice if needed. Pour one cup of white long grain Thai sticky rice into a bowl and cover with water; soak for 1 hour. Rinse rice and drain excess water then transfer rice to a pot. Add coconut milk, Blessing Birdnest drink water, salt and sugar. Cover pot with lid and cook over medium-low for 30 minutes, or until the rice has soaked up the liquid. 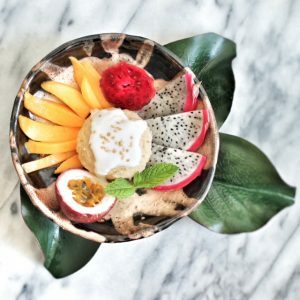 Scoop rice onto a serving dish and top with sweet coconut cream, sesame seeds and fresh fruit.